The world's largest and most populous continent, with four of the five most populated countries in the world (China, India, Indonesia and Pakistan) being located there, including the most populated country in the world, China. Don't engage in a land war there. Asia has played a vital role in the foundation of modern civilization, with the Cradle of Civilization being located in Iraq, where mankind first began to read, write, create laws and live in cities under an organised government, the Arabic numeral system, Buddhism and Hinduism originating from India, gunpowder, papermaking, printing and the compass all originating from China, Christianity, Islam and Judaism all originating from the Near East (which people seem to forget is a part of Asia), and so much more. While it's global influence did wane in favor of North America and Europe for a long period of history after the Mongols and World War II devastated the place, it has seen a resurgence of influence worldwide in recent times. 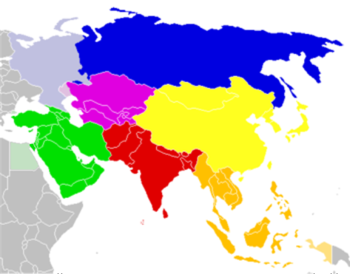 Often lumped in with Oceania as the Asia-Pacific, and sometimes with Europe as Eurasia or Africa and Europe as Afro-Eurasia. 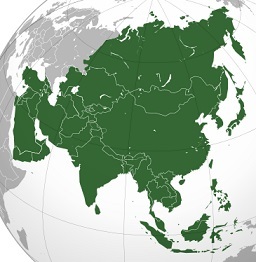 For the list of tropes related to Southeast and East Asians specifically, see the Asian Index. Interchangeable Asian Cultures— How to avert this.